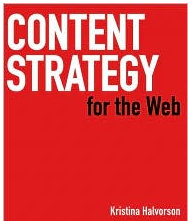 Based on a recommendation from a blog post, I read the book ‘Content Strategy for the Web‘ by Kristina Halvorson. If, like me, you read the classic ‘Don’t make me think‘ by Steve Krug, this book is worth your time. Kristina makes the case for having a web content strategy that helps clarify what you say, how you say it and when to say it. I have seen many web projects where this topic is not given enough attention. It requires last minute heroics from people not directly assigned to the project – not a key to success. Kristina argues that having a plan for web content is a key part of these projects and requires its own unique planning. For many, being a content advocate is a new role. It is different from a content owner, content reviewer, requestor and copywriter. Content (defined) : The use of words and data to create unambigous content that supports meaningful, interactive experiences. A successful content strategy requires formal guiding principles and a authority structure (inc. management support). Content must support key business objectives and enable a customer to complete a task. More content does not equal better content; less content is better. Messaging does not equal content. Content fills a need and establishes emotional connections between people. (Good) Content delights readers when it delivers what it promises. Content is not a feature or a commodity. Content requires care and feeding; it is a complex body of information and does not take care of itself. Content workflow = (interactions among) process + people + tasks. I especially like the point (#5 above) on having less content. It reduces complexity, lowers cost and maintains focus. in the broader view, implementing a content strategy relates to changes in process, behavior and staffing. That level of change can be difficult and Kristina acknowledges this. She provides ideas on what is required to get management support (always a good thing). Other topics related to creating, managing and delivering web content include meta data for search engines (SEO) and localization (translation). Kristina has convinced me that having a content strategist on a project team is a good thing. It is equivalent to, and ,as important as, user experience (UX), site navigation, ensures the content is aligned to business objectives and provides a consistent tone of voice. Knowing the details on how and when content is used helps frame many of the tasks involved in web projects. Also, knowing when to retire content is just as important – part of the care and feeding. What do you think? Does this change your view on web content?